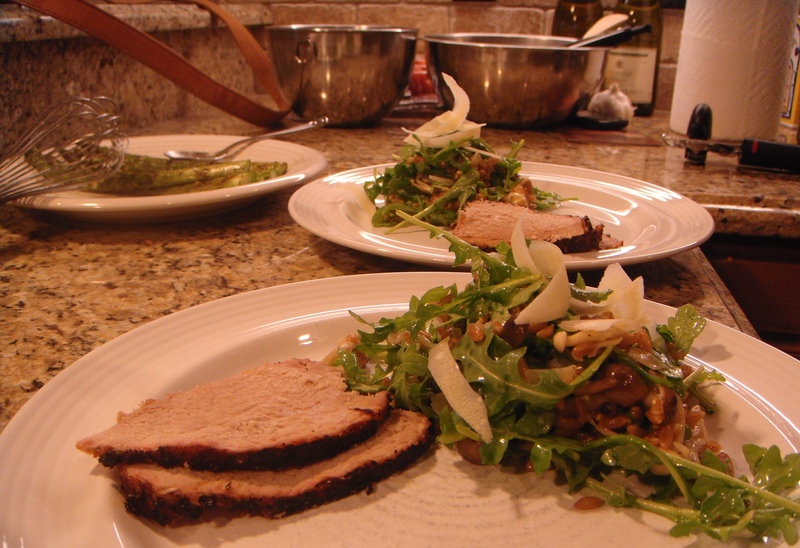 Pork roast and farro, arugula salad. After our decadent weekend of dining out, Sunday dinner was a welcome break. Just before we embarked on our afternoon walk, J rubbed pork leg roast with salt, pepper, Italian seasoning and a generous sprinkling of granulated garlic. He first browned it on a hot grill, giving it a nice crust. Then it went into the oven with a can of beer to maintain a bit of moisture. Four hours at 250 degrees yielded flavorful, tender meat (J thought it was overcooked, I thought it was delicious). 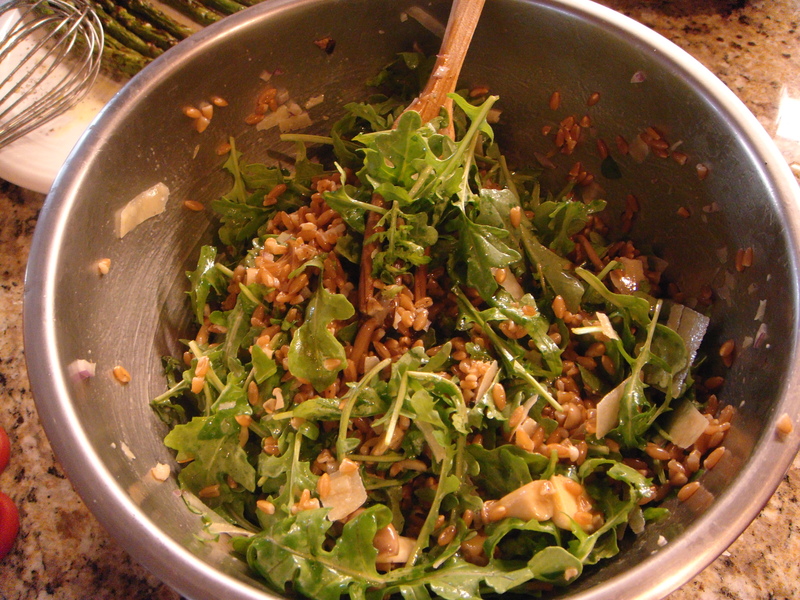 To accompany, we improvised a earthy, peppery salad of farro, mushrooms and baby arugula. 1 pound mixed mushrooms (crimini, shiitaki, oyster and enoki) sauteed in leftover soffrito oil until softened. Cooled. 1 cup farro cooked in 5 cups broth for 50 minutes until al dente. Drained and cooled. 1 package baby arugula. Washed and dried. In a large bowl, I mixed the cooled mushrooms and farro, salting to taste. Then I tossed in baby arugula until there was an even balance, half and half-ish. Spooned on some vinaigrette, then using a veggie peeler, shaved Parmigiano-Reggiano into the bowl and tossed. Garnished with more Parm on the plate. A simple recipe with balanced textures and flavors. This one’s a keeper. Farro, arugula, mushrooms, lemon vinaigrette and cheese.